Key facts: This certified-organic family farm in central Puglia is making some of the best whites in the region today. Who’d think you could make 12 percent alcohol snappy white wine in Italy’s way far south? This is made halfway down the heel of the boot on the Adriatic side of Puglia, in a valley deservedly acclaimed for the quality of its white wines. I enjoy it for the same reasons I like Txakolina from Spain, Vinho Verde from Portugal, Picpoul from France. Break it out with Ceviche. 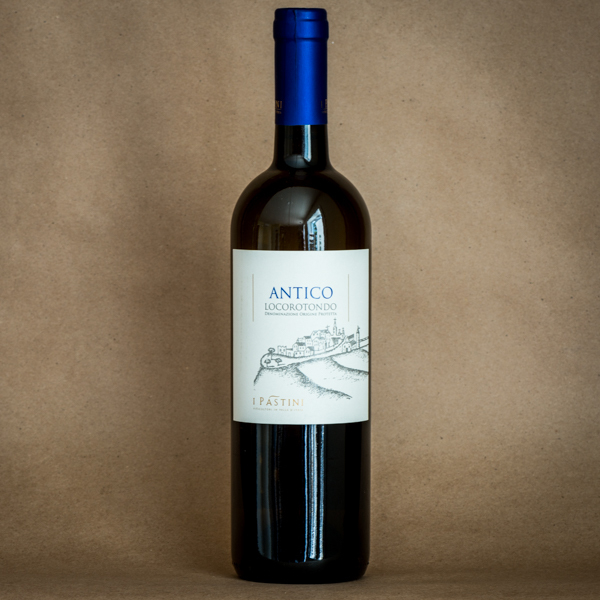 I Pastini Locorotondo bianco (65% Verdeca, 30% Fianco Minutolo, 5% Bianco d’Alessano) has the citrus-saline lightness and vibrance typical of our favorite thirst-quenching Mediterranean whites. Soil type: Alluvial Calcareous/clay soils. High density espalier planting. Elevation: 300 meters above sea level. Method of fermentation: 100% destemmed and co-fermented at low temperatures in stainless steel using native yeasts. The pure Verdeca (Antico is 65% Verdeca, 30% Bianco d’Alessano, 5% Fiano Minutolo) is fuller, richer (slightly) and to my palate more of a poultry white. Donato Carapelli has been getting plenty of attention from the SlowWine guide in Italy for his awesome farming practices, which are very out-of-step with the regional, industrial norm in Puglia. To me this wine tastes straightforward/uncomplicated but really diligently crafted, a simple wine from excellent fruit. 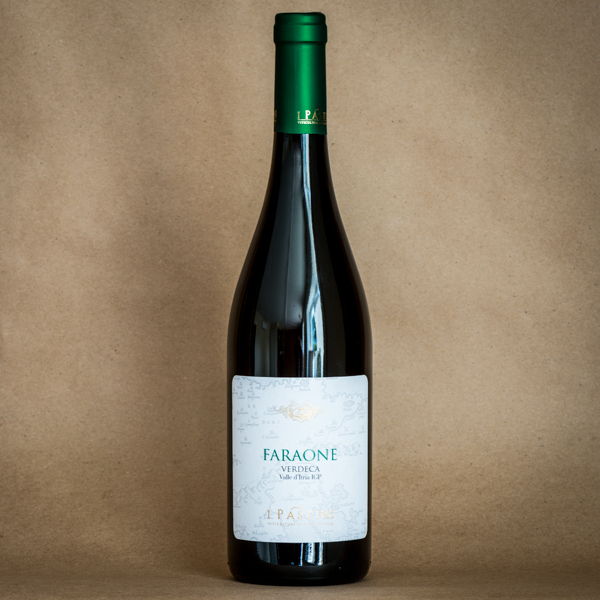 The 2013 Faraone single-vineyard Verdeca has green apple aromatics and a little depth. Floral, fuller, I think of Macon-Villages. Grapes: 100% Verdecca, single plot. Method of fermentation: 100% destemmed, fermented at low temperature in stainless steel tanks with native yeasts. When I arrived in September there were antique sports cars in the parking lot. I asked Donato Carparelli: the cars aren’t his, or Gianni’s. But the beautiful vehicles were a potent symbol of I Pastini’s trajectory. So much has changed in the last four years. On my first trip to Puglia, this was a muddy construction site, unrecognizable as a winery. I sat at the end of their street, hemmed in by sunbaked white rock walls in a tiny drab grey Renault 1, a car that made me feel like a circus clown every time I hauled my 6-foot-two American frame out of it. Gianni found me, baffled, and gave a tour full of his plans for the future. From that first visit, Gianni’s ambition was clear. He was building to optimize the possible quality of their winemaking, to shine a light on the best indigenous white grapes of this special landscape, and to attract the attention of outsiders. Vines push right up to the edge of the new facility. An end of the building opens onto fields of Bianco di Alessano and Minutolo. It feels like a church, with vineyards behind the altar. In the other direction a modern cellar has been constructed that allows easy access for harvesters with small crates of freshly picked fruit. Gianni and Donato use a closed press to minimize exposure to oxygen, and temperature controlled stainless steel tanks to preserve freshness in the wines. While the younger Carparelli was giving a tour, we ambled across the (very active) railroad tracks with Donato to inspect the 16th century trulli that still in use at harvest. The ancient courtyard’s stone oven makes beautiful focaccia for teams of grape pickers. The conical interior rooms remain pleasantly cool on the warmest of days. Conjoined to the trulli is an 18th century addition, a vaguely baroque farmhouse with tiny staircases leading to a roof, from which we surveyed a field of Verdeca, named Faraone. The towns of Martina Franca and Locorotondo were visible from our vantage point, on the horizon in opposite directions along the val d’Itria. A constant light wind blew. East or west, we were not far from the sea. I Pastini is a certified-organic farm. The majority of their fields surround these buildings. The wind minimizes rot and pest issues in their vines. The soil is stony. Impressive old fig trees border the vineyard. We pick a few ripe black figs, and ate them while walking around. Donato is justifiably proud of the viticulture here. I Pastini are moving Locorotondo and the val d’Itria onto the global stage.